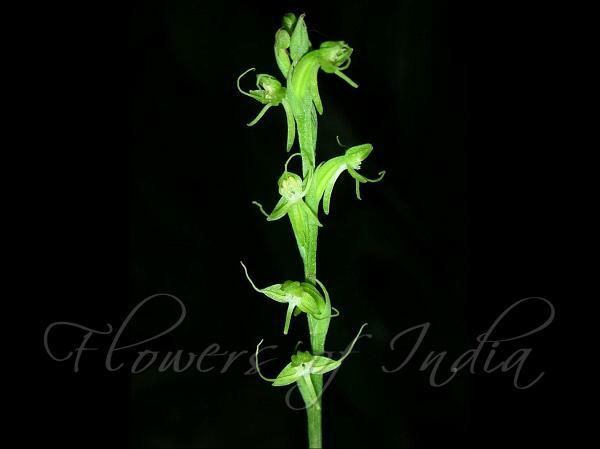 Two-leaved Habenaria is a slender terrestrial orchid, 8-20 cm high. Leaves are unequal, 1.5-2.5 x 1-2.5 cm, broadly round-ovate, blunt to slightly pointed at tip, heart-shaped-stem-clasping at base, appressed to the ground. Spikes 5-15 cm long, flowering at top only; basal portion with few lanceshaped bracts 0.8-1 cm long. Floral bracts 0.6-0.8 cm long. Flowers are 0.6-0.8 cm across. Sepals 0.4 cm long, 0.25-0.3 cm wide, ovate. Petals are 0.4 cm long, linear. Lip 0.7-0.8 cm long, 3-lobed; lobes thread-like. Spur is conical, 0.5-0.6 cm long. Flower-stalk and ovary are 0.5-0.6 cm long. 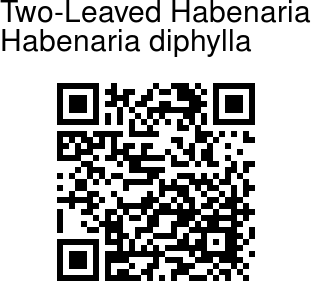 Two-leaved Habenaria is found from India to Bangladesh and Philippines. Flowering: September-November.